Green issues concerning doors are mainly about their insulation values (for external doors) and the materials they are made from. Good external doors are quite hard to source in the UK because we have had a poor tradition of insulating and draught proofing them. This is why eco-house builders often use the imported Scandinavian and German ones which are available here. The materials should be as sustainable as possible and with low embodied energythe total amount of energy it takes to make a material (or a building). See more on embodied energy – Woodmarked timber for instance. They should be well insulated (few UK manufacturers quote U values for doors) and it is the value of the whole doorseta complete package comprising the frame, the door, hinges, ironmongery and any other parts such as draft excluders, intumescent strips and glazing that matters. The Building RegulationsThese are the mass of regulations that cover safety, health, welfare, convenience, energy efficiency etc. in the way buildings are constructed. Not to be confused with Planning consent (which is more to do with whether you can put up the building in the first place). See more on the regulations for doors in new dwellings come under Fabric Standards in part L1AThe Approved documentsApproved documents (England) are detailed publications which come under the English Building Regulations. They are based on tried and tested methods of building and if you follow them you are assured of complying with the Regs. The equivalents for Scotland are the Technical Handbook, for Wales: the Approved documents (Wales), and for N.I. the Technical Booklets, (England) part L1A, deals with Conservation of fuel and power in new dwellings. of the Approved Documents. They should be protected from weather damage. Obviously there are other non-ecological considerations such as appearance and security. 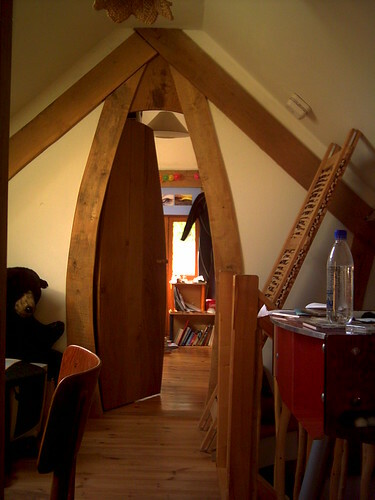 Doors are a great opportunity to get creative and use native, locally sourced timbers. Check that timber door suppliers are using timber with the woodmark. Some manufacturers, particularly the Scandinavian ones use a small amount of aluminium to clad the outer surface of the timber or in the form of a drip section to protect the bottoms of glazed areas. This works very well. The U valuemeasurement of how much heat escapes (or gets in). The units are W/sq.m./°c. see Insulation properties of a solid timber unglazed doorset is about 3.0 W/m²K – quite poor, whereas composite panel doorsets can achieve values of around 0.25W/m²K. Unfortunately most door manufacturers seem unwilling to publish their U values. The building regulations cover the U values of doors and this now includes replacement external doors. Part 1LA of the Building Regulations cover this and can be downloaded as a PDF file. Good draught proofing is essential and is now a factor in the Building Regulations section on air permeability. The problems associated with draught proofing are around endurance. They all work well at the beginning but it is very common (especially with PVC doors) to see draught proofing strips which have been accidentally torn out of place and are impossible to get back or replace with new. The building regulations require that toughened glass is used in certain places where people are liable to injure themselves on impact with the glazing. The darker areas show where toughened glass is required. The image is taken from Approved Document part KThe Approved documents, (England) part K, deals with Protection from falling, collision and impact. Included in this is staircase design of the Building Regulations which explains several other legal requirements of glazing. Fire doors are required in certain situations. These are mainly covered in the Building Regulations Approved Documents part B1 – “Means of Escape[for the purposes of part B of the Approved Documents] - Structural means whereby [in the event of fire] a safe route or routes is or are provided for persons to travel from any point in a building to a place of safety.” and see part B1 Appendix B with its accompanying table showing the locations of the various types of fire door[for the purposes of part B of the Approved Documents] - A door or shutter, provided for the passage of persons, air or objects, which together with its frame and furniture as installed in a building, is intended (when closed) to resist the passage of fire and/or gaseous products of combustion, and is capable of meeting specified performance criteria to those ends. (It may have one or more leaves, and the term includes a cover or other form of protection to an opening in a fire-resisting[for the purposes of part B of the Approved Documents] - The ability of a component or construction of a building to satisfy, for a stated period of time, some or all of the appropriate criteria specified in the relevant part of BS 476 wall or floor, or in a structure surrounding a protected shaft. ).